Time was when the better connected parts of the Indian economy - urban, well-off, angrezi-speaking, insiders etc would skim off the lion's share of growth, of opportunities, of returns from all sorts of asset classes. The less well off and not so well connected would be left at the tender mercies of trickle-down effects and the like. Recent structural socioeconomic reforms seem to have levelled the playing field a tad, seems like. Sample this from ET below. Read in tandem with DBT, DCT, LPG connections, widespread neem-coated urea availability, easier electricity connections and the LED revolution, sanitation improvements yada yada in the less connected parts. Then, contrast that with articles like the ones before - the fire sale of desi corporate assets financed by dubious bank loans on the one hand to a knockout punch landed on the baboo transfer mafia in Delhi (which extracted bribes from officials to fix transfers to lucrative locations where the officials could recover the bribe amount and make some more of their own). Etc. Etc. Onlee. Mod Note: No politics here, thanks. The government will come out with an ordinance to make certain amendments to the Insolvency and Bankruptcy Code, Minister of Finance and Corporate Affairs Arun Jaitley said on Wednesday. The ministry has already set up a 14-member committee to identify and suggest ways to address issues faced in implementation of the law. The Insolvency Law Committee, chaired by Corporate Affairs Secretary Injeti Srinivas, will take stock of the implementation of the Code. More than 300 cases have been admitted for resolution under the Code by the National Company Law Tribunal (NCLT). The government on Wednesday constituted a task force for redrafting the 50-year old income tax law in sync with the economic needs of the country. The six-member task force will have Arbind Modi, CBDT Member (Legislation) as the Convener and other members, including Girish Ahuja (chartered accountant), Rajiv Memani (Chairman and Regional Managing Partner of EY) and Mansi Kedia (Consultant, ICRIER). The panel has been tasked to draft a direct tax legislation keeping in view the tax system prevalent in various countries, the international best practices and economic needs of the country. The Bill had proposed annual I-T exemption limit at Rs 2 lakh, and levying 10 per cent tax on income between Rs 2 lakh and Rs 5 lakh, 20 per cent on Rs 5-10 lakh and 30 per cent above Rs 10 lakh. For domestic companies it suggested tax rate of 30 per cent of business income. The NDA government, since coming to power in 2014, has already implemented general anti-avoidance rules GAAR. In 2016 Finance Minister Arun Jaitley also promised to lower corporate tax rate to 25 per cent in 5 years. Every legislation has a purpose built loophole and backdoor created by vested interests to benefit specific entities. Look at what the baboo(n)s have done in the case of aadhar. why should the subsidies be sent to the last account linked to aadhar?? Many consumers have already specified other accounts for subsidies and other govt benefit transfers. Negating this choice wilfully, illegally, unethically and unauthorisedly linking such payments to their own payments bank is a breach of privacy laws. Their payments banking license should be canceled forthwith. I am sure that in many a posh living room and in the bars of exclusive clubs, numerous toasts would have been raised with heavy crystal glasses of expensive single malt, hailing the "business acumen" and the coup pulled off by the owners of such companies. Bloody crooks, every last one of them, including the high ups from connected ministries who have facilitated this scam. More than 23 lakh customers have received cooking gas subsidy of Rs 47 crore in their respective Airtel Bank accounts they don’t seem to have opened, prompting the government to intervene even as the top mobile operator denied any wrongdoing. Consumers receive cooking gas subsidy in their bank accounts linked to their unique biometric identity, or Aadhaar. But after several consumers lately complained about not receiving subsidy, it emerged that their subsidy had actually been credited to their respective Airtel Bank accounts. The oil ministry has clarified that the rule is to transfer subsidy to the latest bank account of the beneficiary seeded with their Aadhaar number. Since June 9 this year, more than 23 lakh gas consumers received over Rs 47 crore of subsidy in more than 41 lakh transactions in their Airtel Bank accounts, according to a communication sent by a state oil company to National Payments Corporation of India (NPCI). Of these, about 11 lakh gas customers belong to Indian Oil while the balance is evenly split between Bharat Petroleum and Hindustan Petroleum. NPCI maps bank accounts with Aadhaar and oversees retail payments and settlement systems in the country. The state oil firm also told NPCI that Airtel has been opening payments bank accounts of its customers without their consent, and that retail shops representing Airtel do check boxes for opening Airtel Bank account and receiving subsidy while e-verifying customers who had approached them for linking their Aadhaar with their mobile number, or ordered a replacement SIM or a new connection. The firm has also urged NPCI to stop further Aadhaar number being seeded into Airtel Bank without consumer consent and get Rs 47 crore transferred from Airtel Bank to the customers’ existing Bank Accounts where the subsidy should have gone in the first place. More than 23 lakh customers have received cooking gas of Rs 47 crore in their respective Bank accounts they don’t seem to have opened, prompting the government to intervene even as the top mobile operator denied any wrongdoing. Consumers receive cooking gas subsidy in their bank accounts linked to their unique biometric identity, or Aadhaar. But after several consumers lately complained about not receiving subsidy, it emerged that their subsidy had actually been credited to their respective Airtel Bank accounts. The oil ministry has clarified that the rule is to transfer subsidy to the latest bank account of the beneficiary seeded with their Aadhaar number. Since June 9 this year, more than 23 lakh gas consumers received over Rs 47 crore of subsidy in more than 41 lakh transactions in their Airtel Bank accounts, according to a communication sent by a state oil company to National Payments Corporation of India (NPCI). Of these, about 11 lakh gas customers belong to Indian Oil while the balance is evenly split between Bharat Petroleum petroleum-corporation and Hindustan Petroleum NPCI maps bank accounts with Aadhaar and oversees retail payments and settlement systems in the country. The state oil firm also told NPCI that Airtel has been opening payments bank accounts of its customers without their consent, and that retail shops representing Airtel do check boxes for opening Airtel Bank account and receiving subsidy while e-verifying customers who had approached them for linking their Aadhaar with their mobile number, or ordered a replacement SIM or a new connection. The firm has also urged NPCI to stop further Aadhaar number being seeded into Airtel Bank without consumer consent and get Rs 47 crore transferred from Airtel Bank to the customers’ existing bank accounts where the subsidy should have gone in the first place. The oil ministry said it has also taken up the matter with Airtel, NPCI and the finance ministry in this regard. The country’s top mobile operator has denied any wrongdoing, saying it was transparently abiding by the law. “Airtel Payments Bank is fully compliant with all guidelines and follows a stringent customer onboarding process,” the telco said in response to ET’s query. “Airtel Payment Bank accounts are opened only after explicit consent from the customer. A separate consent for direct benefit transfer is taken from all customers,” it said. In September, "UIDAI" , which issues Aadhaar, had served a notice on Airtel following complaints over its retailers allegedly opening payments bank accounts without taking informed consent of customers seeking Aadhaar-based mobile number verification. Airtel began operating a payment bank last year after the RBI allowed opening of such banks, which can’t lend like traditional banks and must have a minimum paid-up equity capital of Rs 100 crore. Unbelievable speed. Who would have thunk one day we would have a govt that would respond with such alacrity to suggestions made on the web. Dread to think what a change of govt would do to us after getting used to a receptive govt. chetak wrote: Every legislation has a purpose built loophole and backdoor created by vested interests to benefit specific entities. Look at what the baboo(n)s have done in the case of aadhar. If the GoI itself allows baniyas like AirTel to get away with such schemes, then they are undermining their own case for Aadhaar. Not only should AirTel be asked to transfer the money out of their payment bank accounts (a no cost to the subsidy receiver) there should also be a heavy fine put on them, with perhaps good media campaign indicating that "justice has been done" (and is seen to be done). I now fully endorse the view of Chanakya, when he said that a trader/businessman would cheat if given a chance to cheat. Chanakya always recommended higher punishments for traders/businessmen precisely for this reason. the ministry baboo(n)s and vested interest NGOs have a much greater horizon of vision than the ordinary aam aadmi because of their lofty perches. like birds of prey, they also have a keen vision and self interest in what can assuage their hunger. many foreign entities openly provide our MPs and legislators with free "administrative assistants" via the NGO route to "help draft legislation", allegedly because of the "complexity" of issues involved. This is a scam by itself and one with major national security implications. This "administrative assistants" business gives them advance warning of the govt's intent and also the golden opportunity to tailor laws accordingly with loopholes and trapdoors that are known only to a select few but soon become apparent when the law kicks in and some entity suddenly starts to benefit. It is only the well networked baboo(n)s who have the big picture view of the entire gamut of the legislative pipeline and which legislation has multi ministry implications and so which backdoors are best suited to exploit loopholes. This aadhar + payments bank scam is not something that just happened but it is a designer loophole built in after gauging the financial windfall. just see how the aadhar + payments bank scam was smuggled past a proactive, hardworking and dedicated minister in the oil ministry and the owners are well known dyed in the wool dynasty supporters. It simply cannot be done without the baboo(n)s being majorly complicit. Other companies besides airtel are also involved. Last edited by Suraj on 23 Nov 2017 13:21, edited 1 time in total. Reason: This thread is not an appropriate place to propagate chain messages. There was a move contemplated by Government to bar the promoters from bidding for their own companies even before Kotak's interview and there were press articles asking the government to bar promoters to bid for their own companies after default. No matter how efficient the government is no ordinance can be framed in 24 hours (considerable legal points to ponder on) and is rushed to and signed by the President (who again is briefed by legal experts) to become a law. 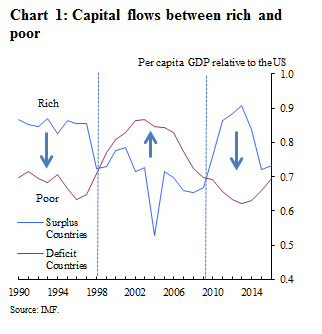 Alfaro and Chauvin caution that the broad finding from the macro literature is that across countries, FDI is not unambiguously associated with GDP growth; sound local financial markets are an important precondition for benefits of FDI to materialize. But inflows of FDI do seem less likely to end in tears. The stylised Lucas Paradox was never the puzzle that overall current account data suggested. 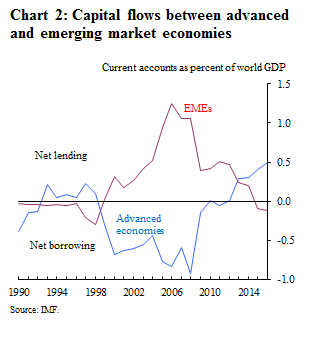 EMEs have benefited from net flows of private capital from advanced economies before and after the global financial crisis, masked by the behaviour of sovereigns and their reserve accumulation. 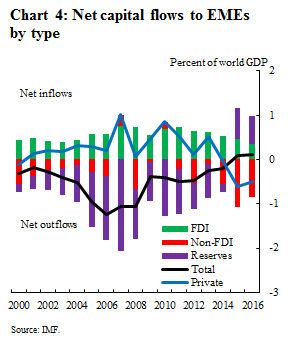 But some elements of these private flows (portfolio and banking) have proven fickle in recent years. 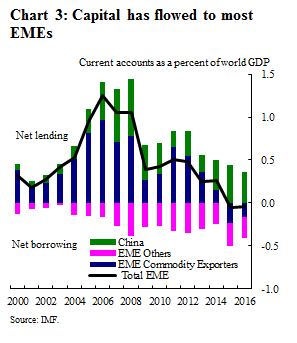 If EMEs are to successfully ride the current wave of positive sentiment, in the face of a normalisation of monetary policy in advanced economies, they will need to continue to strengthen the credibility of their policy frameworks and institutions. new thread please. do not forget to copy the 1st post of this one.